I did it. 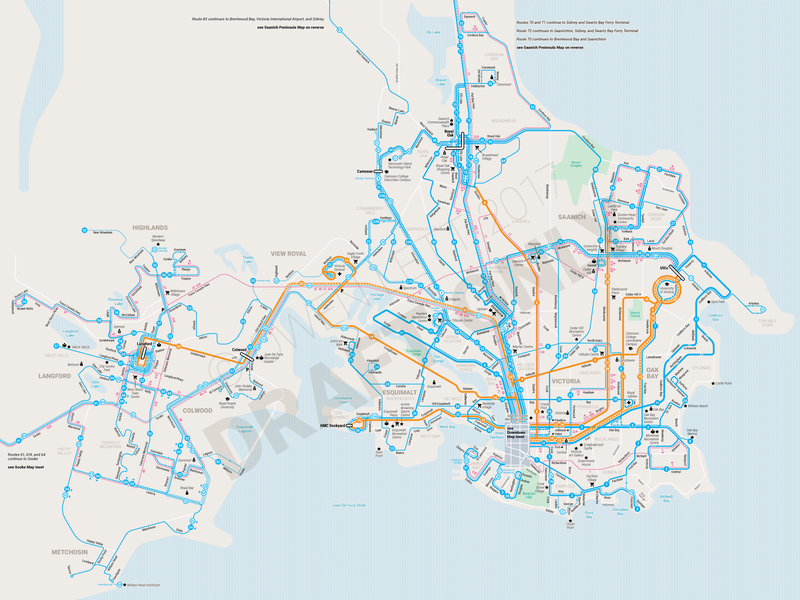 After over three years in the making, here is the first complete version of my frequency enhanced transit map of all fixed-route bus services within Victoria, British Columbia. There were two primary purposes for this map: to make routes more legible from end to end, and to show different levels of service frequency. The overall design is greatly influenced by the work of CHK America, in particular their Austin, Honolulu, and Orlando transit maps. The 2016 redesign of the Toronto Transit Commission system map was also an inspiration. I’ve simplified (and somewhat distorted) the geography and separated as many routes as possible into their own lines. Streets/routes have also been simplified, mostly using a 15º grid. The L-shape of Victoria’s service area did unfortunately mean I had to use inset maps. For the different frequency levels, I’ve set three line thicknesses for daytime service levels: one for 15 minutes or better, one for 30 minutes or better, and one for all other all-day weekday service. Limited stop/express service is displayed as an inline dash for any of these frequencies. Peak routes operate only Monday to Friday, at peak hours. Peak routes also have route numbers displays separately to help differentiate their service levels. Standard routes operate all day, Monday to Friday, with most operating on weekends and in evenings. Frequent routes operate seven days a week, with 15 minute or better service Monday to Friday during the daytime and evenings, and Saturday during the day. These routes also operate with 30 minute service or better at all other times. Some Standard routes operate 15 minutes or better during the day on weekdays, but not in evenings or on weekends (such as 2/2A and 11), so they keep the same thickness as the Frequent routes but have Standard colouring. Route colours were chosen to be bright, but not too ‘neon’ while also being colour-blind friendly. I tried to make fonts as large as possible, keeping in mind the larger number of older transit customers. Street names are 7pt, route numbers are 8.25pt which are pretty large for a transit map. I had originally started with DIN Next, but switched to Roboto as I thought it would be easier for others to work with in the event that this map is released open source. 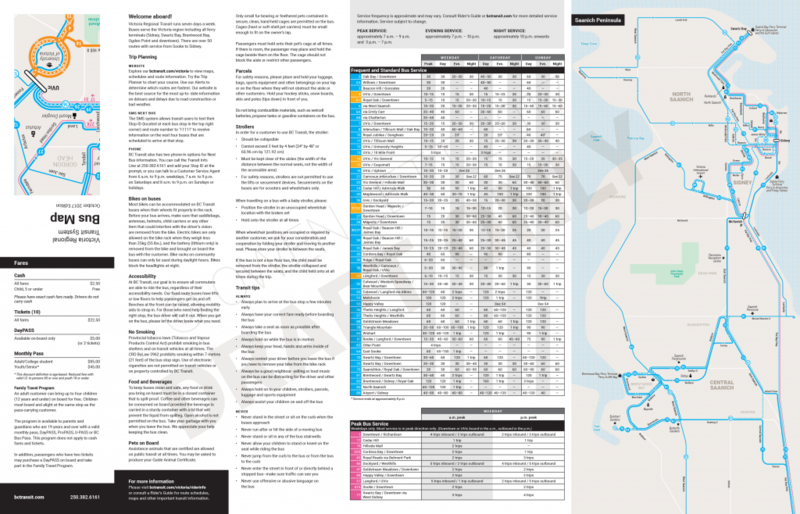 This map is sized at 28″x18″, which folds down nicely to 4″x9″ – the same size as BC Transit’s Riders Guide (I had originally wanted to go with 24″x18″, but I couldn’t fit in all the insets and legend). It will fit nicely into rack card holders on buses, in libraries/stores, and on BC Ferries. 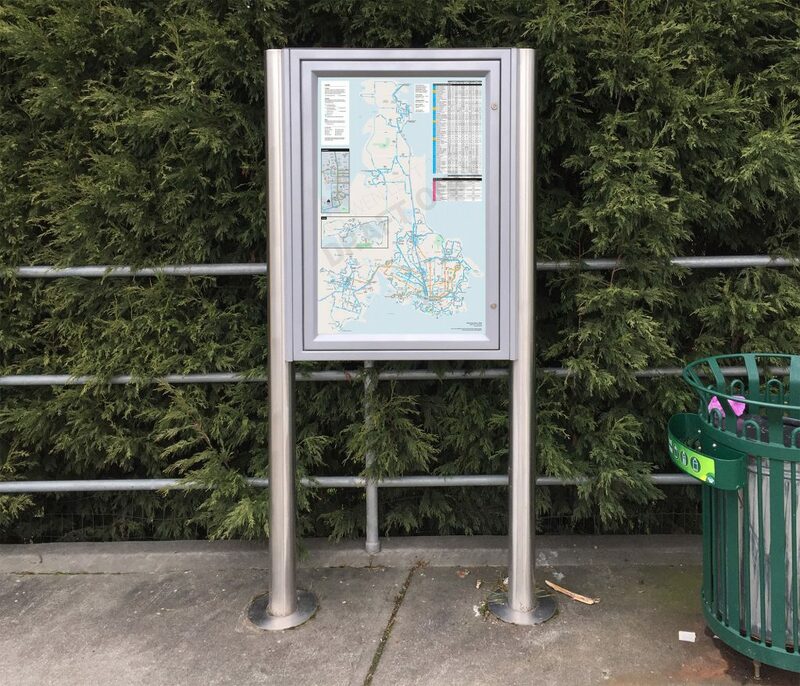 The number of folds is kept somewhat minimal (seven total) and completely unfolded, the map shouldn’t be much wider than a single seat on board a bus. It can also be easily adapted to a 24″x36″ poster! Several bus exchanges throughout the region already have information boards where this poster could fit. 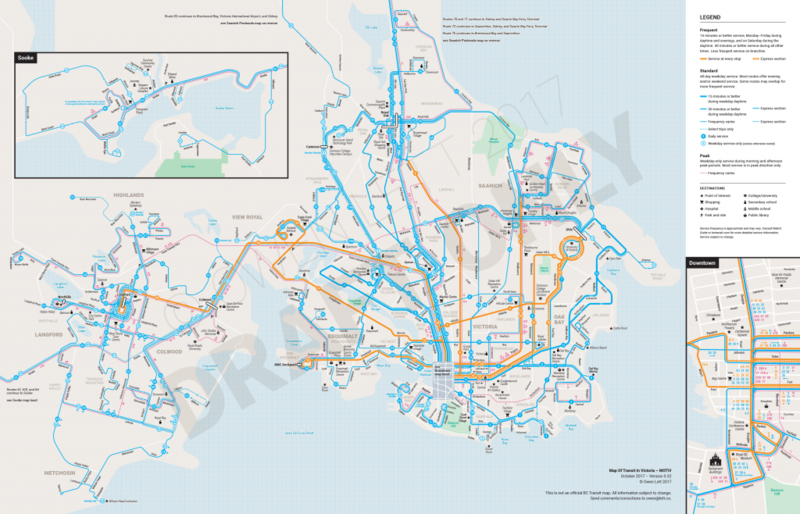 Granted, it would probably be hard to read at a distance, but the opportunity still exists to provide an overview of the entire Victoria transit network. Also my research into frequency and routing has been spaced out over three years, so some of this information may actually be out of date. I went back to double check everything, but I’m sure I missed something. This is by no means the final version of the map. But I was tired of it languishing on my hard drive incomplete. So this is the first release of the whole thing, and I hope people enjoy it. Recently, Cameron Booth (aka @transitmap) posted a small thumbnail of an Victoria streetcar map I’d never seen before. Apparently at one point in time it had been posted to vihistory.ca but the links and map viewer were no longer working. Information on vihistory.ca lead me to contacting Dr. Patrick Dunae, who is an Adjunct Associate Professor in the Department of History at the University of Victoria. He very kindly answered my questions and provided his original scan of the map (which can be downloaded in high-res here). Dr. Dunae also said that his notes indicated this map was from 1902. This map is beautifully detailed, showing forest, farmland, naval vessels, some select buildings, and my personal favourite curiousity – “headquarters of the sealing fleet”. 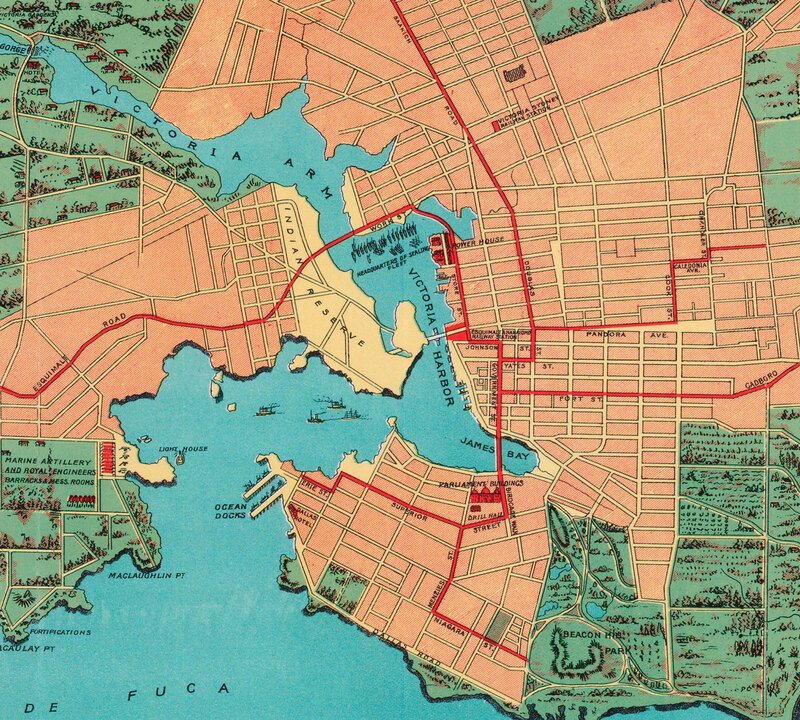 The streetcar system (run by the British Columbia Electric Railway) is clearly shown in red, with almost no street names being listed except where the network runs. Interestingly, this other map (listed as ‘December 1902’) shows several more lines extending into Fairfield, Vic West, and Hillside. 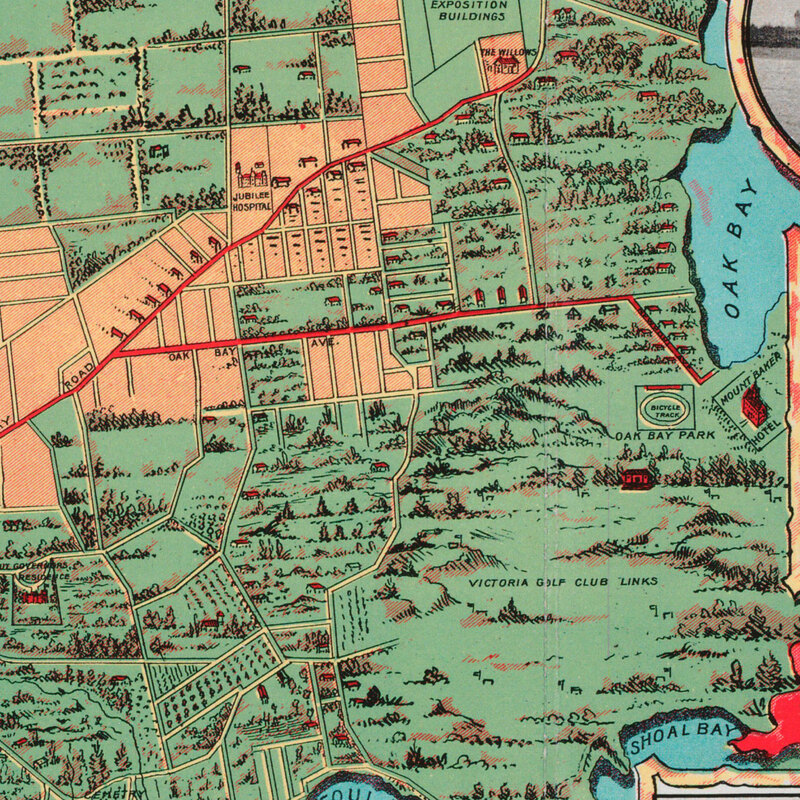 It’s possible this map is from earlier than 1902, but it’s also certainly possible Victoria (and its streetcar network) expanded quickly throughout 1902. Also worth noting is the Mount Baker Hotel, which is shown here perhaps for the last time as it burns down in September of 1902. The last streetcar ran in Victoria in 1948. Today there’s constant talk (and little more) of bringing commuter rail back to southern Vancouver Island. But it’s doubtful we’ll ever see rails in Victoria’s streets again, despite what some might dream up. Happy 2017! As a present to myself (and to whomever actually reads this), here’s an actual blog post to start the year! And guess what? This post will be an update on the last post (from over a year ago). Below is the exact same map region as what I posted in October 2015, but with a few changes. If you want to see the full Victoria/Saanich/West Shore region of the map as of this morning, you can see it here. Unlike my previous mapping project for Victoria, this latest one uses only existing services. 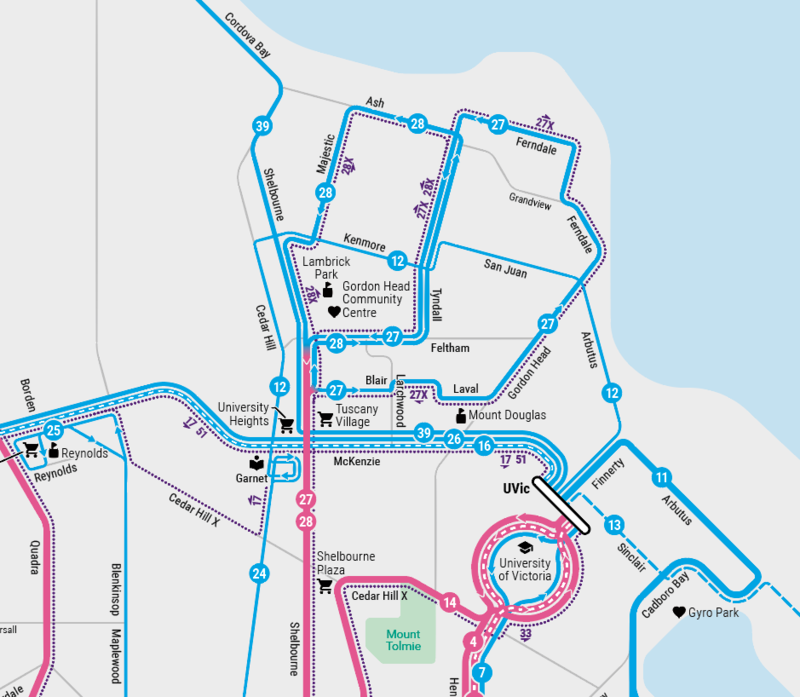 This is an attempt to improve the clarity of the current Victoria bus network, and create a legible, usable map. The end goal is to print a physical map, sized 24″x18″ (which would fold down to 4″x9″, matching the size of the current Rider’s Guide). Victoria and the West Shore are on one side, and the Peninsula is on the reverse. As a single piece, it’s 24″x36″, which could potentially be used as a poster at bus shelters. There are two primary purposes for this map: to make routes clearly to follow, and to show different levels of service frequency. The larger print size does help make the routes more legible, but I’ve also simplified (and somewhat distorted) the geography and separated as many routes as possible into their own lines. Streets/routes have also been simplified, mostly using a 15º grid. For the different frequency levels, I’ve set three line thicknesses for daytime service levels: one for 15 minutes or better, one for 30 minutes or better, and one for 60 minutes or better. Anything less than 60 minutes gets a dashed treatment. Limited stop service is displayed as an inline dash for any of these frequencies. Commuter routes operate only Monday to Friday, at peak hours. Regular routes operate all day, Monday to Friday, with most operating on weekends and in evenings. Frequent routes operate seven days a week, with 15 minute or better service 7am–10pm Monday to Friday and 8am–6pm Saturday, with 30 minute service or better at all other times. Each service type has its own colour and line design. Some Regular routes operate 15 minutes or better, but not in evenings or on weekends (such as 2/2A and 11), so they keep the same thickness as the Frequent routes but have Regular colouring. At this point, this map has gone through numerous revisions and I’ve redrawn it about 4 times already. Originally I had designed it to be much larger, but then chose to consider a smaller map that would be easier to handle physically. I also showed a fourth service type (Express) but with only three routes meeting that criteria, it just added unnecessary noise. Type has changed, colours have changed. Right now only a small portion of the map is what I would call ‘final’. There’s still a lot of work to do, but at least at this point I’ve nailed down the sizing. Now I’ve just got to draw the rest of it out. 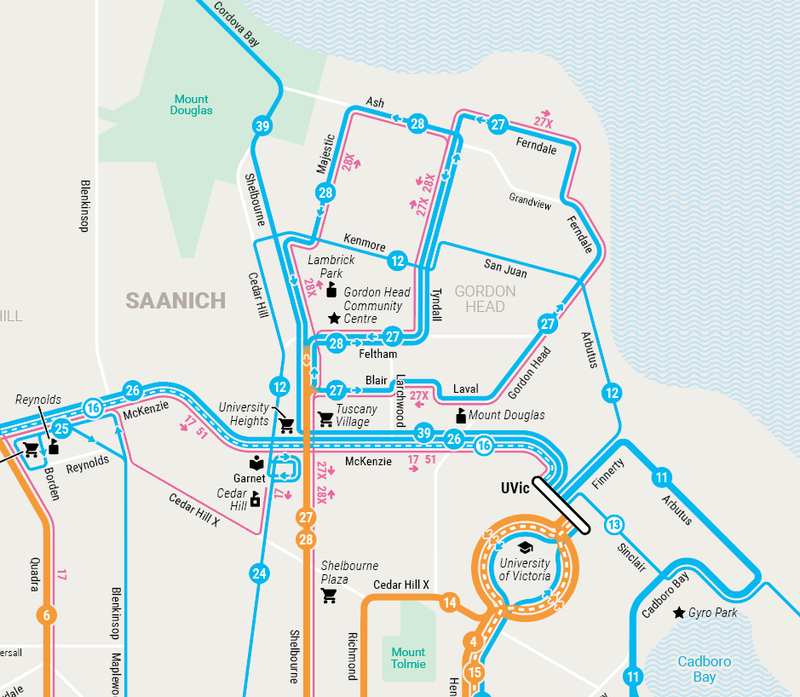 At some point in the future, I will post the final map and also a comparison with the existing Victoria transit map. Hope no one changes any services until then!